The honor of one is the honor of all. The hurt of one is the hurt of all. 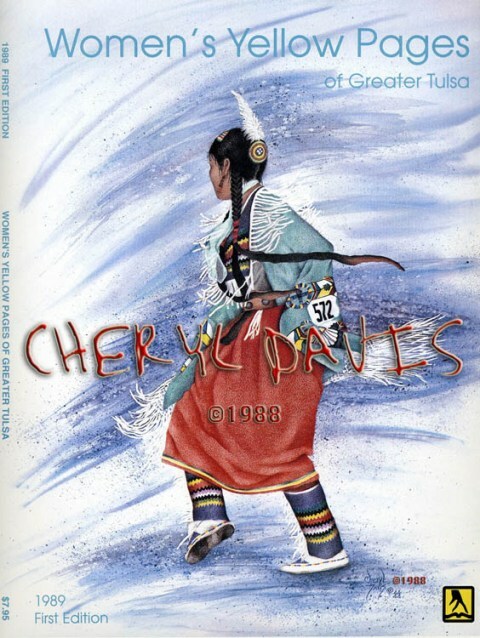 This is the cover I did for Tulsa’s 1989 First Edition Women’s Yellow Pages. 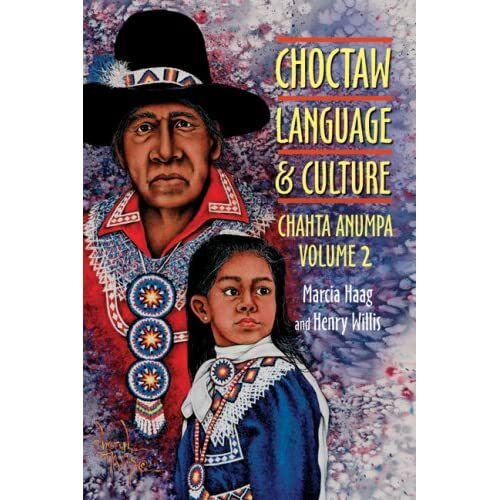 I was very honored to be asked to create the2nd Choctaw Language book cover titled: Choctaw Language and Culture: Chahta Anumpa Volume 2 (Paperback) by Marcia Haag (Author), Henry Willis (Author). The subjects are the Mississippi Choctaw. The relationship I had with my grandparents has always been very important to me and I wanted to reflect that important relationship between grandparents and grandchildren (also, between elders and children in general) in this piece of art. Grandparents (and all our elders) give us such “gifts” and it is our duty to pass those gifts on to the next generations. It is said that our life will impact 4 generations after us by how we choose to live our life and by what influences we choose to leave behind… positive or negative. I was also blessed to have known many of my very special great-aunts and great-uncles in addition to my wonderful aunts and uncles; and also knew two of my great-grandmothers, both of whom lived to be almost 100 years old. Their wisdom was beyond measure and the privilege of knowing them… a treasure. So inspiration for this piece of art was abounding. The Choctaw language is an essential element of the Tribal culture, tradition and identity. The language links modern Choctaws to their ancestors, offering a common vocabulary and way of looking at the world. Many of today’s Choctaw adults and elders learned to speak Choctaw before they learned English. Many grew up with grandparents and other relatives who spoke Choctaw most of the time. Their earliest memories are likely to include stories in Choctaw, the sound of Choctaw hymns, and the cadences of Choctaw speech and laughter as the family gathered in the evening to discuss the day’s events. A part of daily life on the Reservation, the Choctaw language may be heard in Tribal schools and administrative offices. It is in the Choctaw communities and homes, though, where the language is most deeply rooted. While they encourage their children to hone their communications skills in English, most Choctaw parents also make sure that their sons and daughters speak Choctaw as well. Our Choctaw children today, for various reasons, are speaking mostly English. Language loss is usually caused by a number of things such as mixed marriages, modern technology, the environment, etc. In some instances, parents who speak English all day at work do not shift back to Choctaw when they get home. Because English is every where, there is no danger that children will not learn English. However, there is suddenly a critical danger that they will not learn their Native language, Choctaw. The majority of Choctaw speakers are over 45, though in Mississippi efforts are being made to pass the language on to the younger generation & some children are being raised with Choctaw as their first language. Imagine that! Hattak yuka keyu hokʊtto yakohmit itibachʊfat hieli kʊt, nan isht imaiʊlhpiesa atokmʊt itilawashke; yohmi ha hattak nana hohkia, keyukmʊt kanohmi hohkia okla moma nana isht aim aiʊlhpiesa, micha isht aimaiʊlhtoba he aima ka kanohmi bano hosh isht ik imaiʊlhpieso kashke. Amba moma kʊt nana isht imachukma chi ho tuksʊli hokmakashke. That all free men, when they form a special compact, are equal in rights, and that no man or set of men are entitled to exclusive, separate public emolument or privileges from the community, but in consideration of public services. (Source: Answers.com) The Choctaw language, traditionally spoken by the Native American Choctaw people of the southeastern United States, is a member of the Muskogean family. The Choctaw language was well known as a lingua franca of the frontiersmen of the early 19th Century, including eventual American Presidents Andrew Jackson and William Henry Harrison. The language is very closely related to Chickasaw and some linguists consider the two dialects of a single language, although recent reports indicate that speakers of Choctaw find Chickasaw to be unintelligible. Some orthographies use <š> and <č> for /ʃ/ and /ʧ/; others use the digraphs <sh> and <ch>. /j/ is spelled <y>, and most modern orthographies use <lh> to represent the lateral fricative. In closed syllables, [ɪ], [ʊ], and [ə] occur as allophonic variants of /i/, /o/, and /a/. In the orthography, nasalized vowels are usually indicated by underlining the vowel (e.g., o̱ represents /õː/), and the allophonic [ʊ] is often written <u>. Some orthographies use <v> and <u> to represent the lax allophones of short /a/ and /o/–that is, [ə] and [ʊ]. These orthographies also use <e> to represent some cases of /iː/, and <i> for others, and also use <a>, <i>, and <o> to represent both the long and short phonemes of /a/, /i/, and /o/. See you later! : Chi pisa la chike! What is your name? : Chi hohchifo yut nanta? I don’t understand. : Ak akostinincho. Do you speak Choctaw? : Chahta imanumpa ish anumpola hinla ho̱? What is that? : Yummut nanta? This is the book cover I was selected to create for the Choctaw Language and Culture: Chahta Anumpa (Paperback), Volume One by Marcia Haag (Author), Henry Willis (Author), Grayson Noley (Foreword). It was an absolute pleasure and honor to be a part of this project. I enjoy studying the Choctaw Language and was able to take Choctaw Language I, II & III at OU, taught by Marcia Haag, and Henry Willis, speaker. (I took Choctaw I with my oldest son. It helped taking it with someone so you could practice speaking & study together.) I need a refresher!